“Welcome to the West Coast, and welcome to some buoyant cool jazz on Capistrano Sessions. 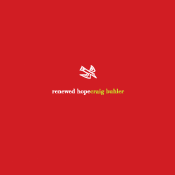 Multiple reedist Craig Buhler(clarinet, alto and tenor saxes) takes us on a “trip along the Pacific Coast on this recording. This quintet outing fits the mold of fellow West Coaster Art Pepper’s sound, though Buhler and his mates have perhaps a more upbeat, outgoing and slightly less intense approach. 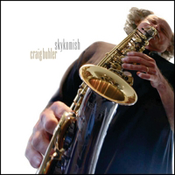 This disc of all original material opens with a zingy, swinging “Lookear,” where Buhler blows alto; and, as on all three of the axes he wields here, his sound is distinctive: warm and open, with a hint of blur around its edges. 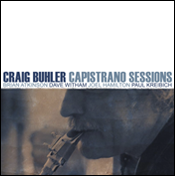 On “Capistrano,” Buhler breaks out the clarinet, and trumpeter/flugelhornist Brian Atkinson goes mallet man, playing vibes to give the tune a gleaming bounce. ”October,” one of the more introspective moments of the set, features Buhler playing a soulful tenor sax with a deep, rich tone. “Molly Ann” sounds as if it could have been titled “Maria Anna.” It’s got a fine Latin vibe—Buhler scorches the air waves on saxophone, and Brian Atkinson blows a loose, relaxed trumpet solo. Track listing: Lookear; Capistrano; Rivers; October; Paris Buffet; Himilayan; Migration; Molly ann; Quiet Passion; Madrid Session; Harbor Cafe Blues. 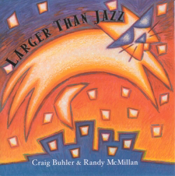 Personnel: Craig Buhler: clarinet, alto saxophone, tenor saxophone; Brian Atkinson:vtrumpet, flugelhorn; Dave Witham: piano; Joel Hamilton: bass; Paul Kreibich: drums, percussion.